With how engaged we are on international pageants, it's quite a surprise to know that we have never won Miss Intercontinental. A Filipina was crowned at least once in all major and second tier international pageants including Miss Universe, Miss World, Miss International, Miss Earth, Miss Supranational, Miss Globe and Miss Asia Pacific but one of the oldest titles, Miss Intercontinental has been quite a stranger. Early morning in Manila, December 19th, and late evening of December 18th at the pageant venue in Magdeburg, Germany, Philippines almost won the crown. Christi Lynn McGarry showed a very strong performance which made her First Runner-up. Russia's Valentina Rasulova won. It was a tough competition for Christi to begin with but it was also her second try at the pageant after she finished in the Top 15 at the 2010 pageant. The local franchise holder of Miss Intercontinental in the Philippines is Mutya Ng Pilipinas until it was handed over to Binibining Pilipinas last year. McGarry won the crown and the opportunity to represent the country again when she joined Binibini earlier this year. Miss Philippines moved closer to the title by entering the Top 17 first and then advancing to the Top 10. She won the Miss Asia Intercontinental special award despite a close contest with 5 other Asians in the Top 17 including Misses India, South Korea, Thailand and Vietnam. Christi Lynn McGarry, whose Filipino roots hails from Nabua in Camarines Sur, is Miss Intercontinental First Runner-up. She is also the third Filipina in a row to win Miss Asia Intercontinental after Kris Tiffany Janson in 2014 and Andrea Koreen Medina in 2013. Valentine Rasulova becomes Russia's third Miss Intercontinental. She won the title in Magdeburg, Germany on December 18th (December 19th in the Philippines). She won over 65 other candidates from all over the world. The new Miss Intercontinental and her court. 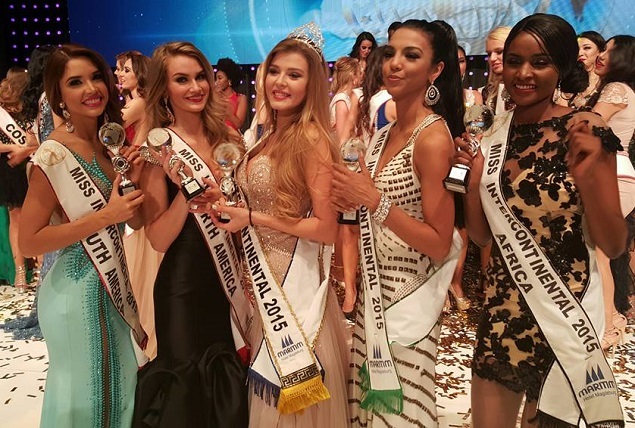 L-R: Third Runner-up Katherine Garcia of Venezuela, Second Runner-up Brianne Bailey of USA, winner Valentine Rasulova of Russia, First Runner-up Christi Lynn McGarry of the Philippines, and Fourth Runner-up Tendai Humda of Zimbabwe. Christi's special award as Miss Asia Intercontinental is third in a row for the Philippines. Kris Tiffany Janson's won the same title last year and Andrea Koreen Medina clinched the title in 2013. Janson eventually placed Second Runner-up while Medina placed Third Runner-up. Pageant experts consider Miss Russia's win as a surprise since she wasn't viewed to be a contender by pageant websites. Rasulova, nevertheless, became the third Russian to win the Miss Intercontinental crown after Alyona Ivanova won in 1991 and Ekaterina Plekhova in 2013. 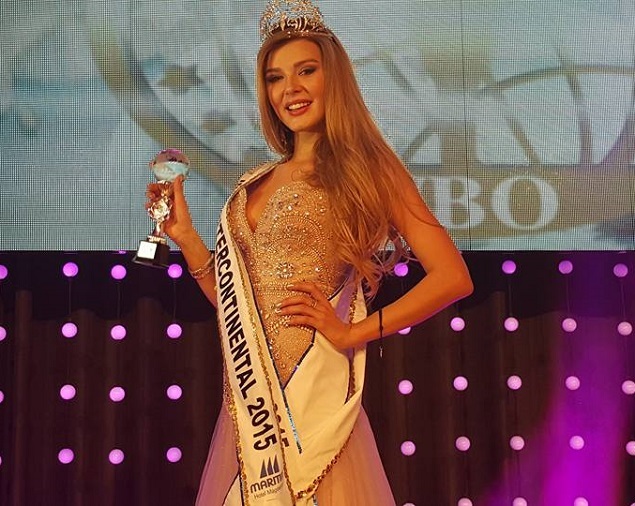 Miss Russia was also awarded Miss Europe Intercontinental. Miss USA Brianne Bailey is Second Runner-up, also Miss North America Intercontinental. Venezuela's Katherine Garcia, meanwhile, place Third Runner-up after winning Miss South American Intercontinental. Completing the winners' circle is Tendai Humda of Zimbabwe who placed Fourth Runner-up and also awarded as Miss Africa International. Miss Intercontinental is actually a Spanish organization which has been holding the pageant mostly in Europe. This year was the third time for the German city of Magdeburg to host. The pageant has been held 43 times with traditional powerhouses Venezuela and the USA emerging as the winningest with 5 wins each. Puerto Rico and Germany also have notable histories in the pageant, winning three titles together with Russia. Thanks for share this comment to communicate all member to each other and get best ideas and tips on any topics for better knowledge.